This book contains everything you need to know to become your own makeup artist. All of the information is 100% unbiased and unsponsored and it is based on my years of professional experience. Currently scheduled to launch in early summer. Click the link below to pre-order and be the first to receive a digital copy of this 60+ page comprehensive and interactive book. You can also sign up to receive occasional email updates about the status of the book. 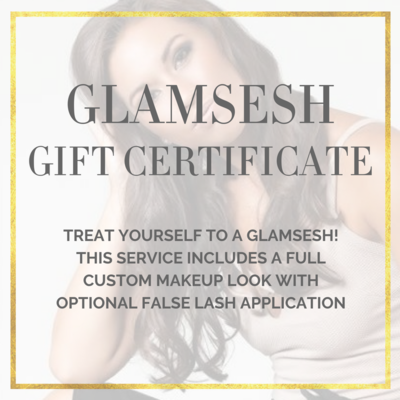 We all deserve a Glamsesh every now and then! Whether you have a wedding, reunion, gala, or some other special event, Natalie will have you walking into the room with confidence. Also makes a great gift for someone who deserves a little pampering. 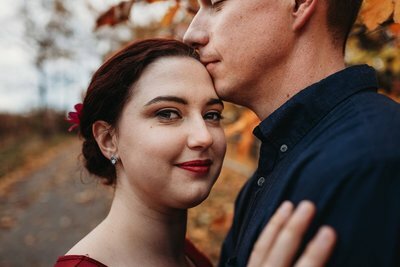 This signature makeup session includes a full face of makeup, perfect for any special occasion or HD photography session. Relax in Natalie’s luxurious home-based makeup studio and enjoy complimentary sekt or sparkling cider, and German chocolate. Session lasts approximately 1 hour. 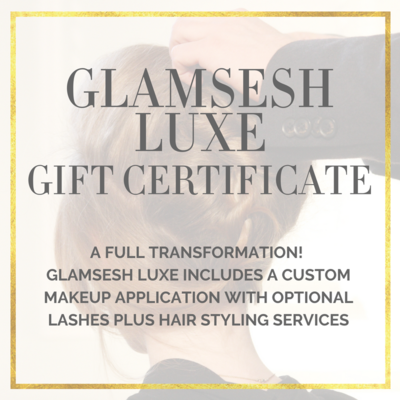 Give the gift of a totally custom professional hair and makeup look! 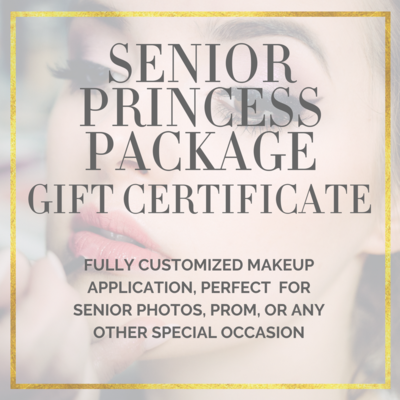 This gift certificate covers everything, from a gorgeous updo to the perfect lip color to the false lashes, and even complimentary sekt and delicious German chocolate! It’s the prefect way to show someone how important they are and how much they deserve to be pampered. 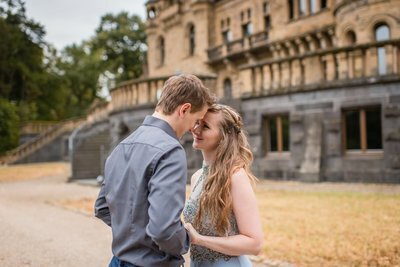 This service is perfect for any special occasion or HD photography session, and it takes place in Natalie’s luxurious home-based makeup studio and lasts approximately 1.5 - 2 hours. 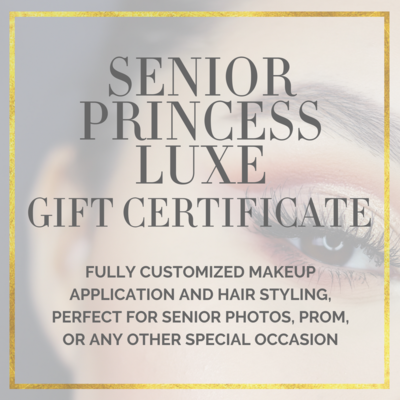 If you know a senior or soon-to-be-senior that loves to get pampered, this is THE perfect gift idea. 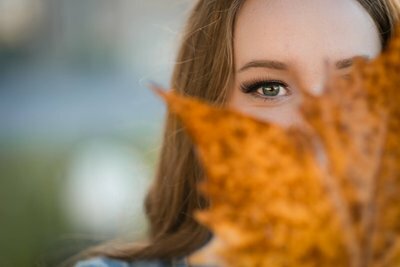 Session includes a full custom face makeup look, which is perfect for senior photos, prom, or any other special occasion or HD photography session! Appointment takes place in Natalie’s luxurious home-based makeup studio. We’ll have a blast chatting and creating the perfect makeup look together. Includes false eyelashes, complimentary sparkling cider (or sekt, if okay’d by the ‘rents), and German chocolate. Approximately 1 hour. The perfect gift for the senior or soon-to-be-senior in your life. 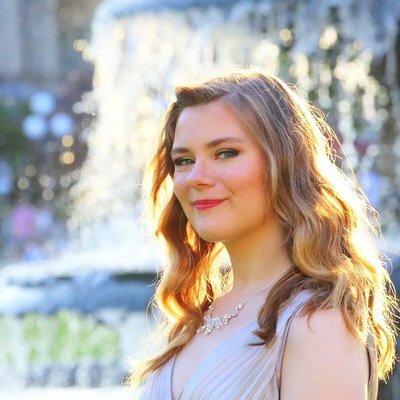 Session includes a full custom face makeup look and hair styling; perfec for senior photos, prom, or any other special occasion or HD photography session! We’ll meet in my home studio and have a blast chatting, eating chocolate, and creating the perfect makeup and hair look for your special princess. Includes false eyelashes, hair styling, complimentary sparkling cider or sekt (if ok’d by the ‘rents), and German chocolate. Approximately 1.5 hours. Want to learn how to wear makeup, practice new techniques, or refresh your look? Treat yourself or a loved one to the gift of makeup knowledge! You’ll leave with so much more knowledge and confidence when it comes to wearing, buying, and using makeup to look and feel like the best version of you. 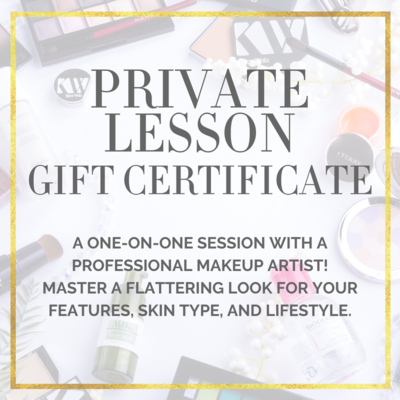 This gift certificate covers a private, one-on-one makeup session with Natalie Setareh in her home studio. The one hour lesson can be catered to your specific interests or questions. 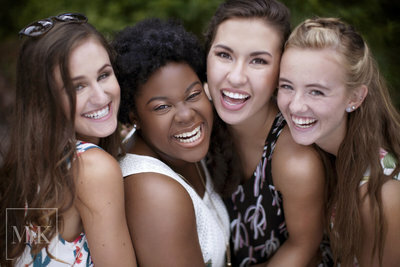 Learn your ideal eyeshadow shades, get “tricks of the trade” and talk products with a professional makeup artist! Makeup artists, don’t spend all your time on emails, invoices, and back-and-forth messages with clients. 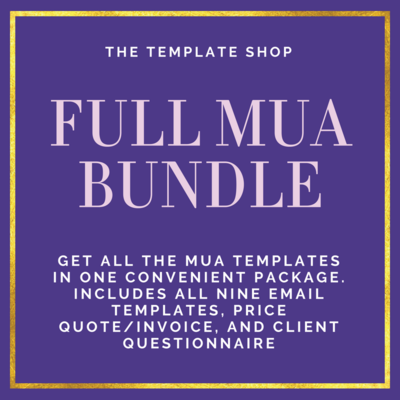 The MUA bundle includes everything you need to run your business efficiently so you can spend more time doing what you love! 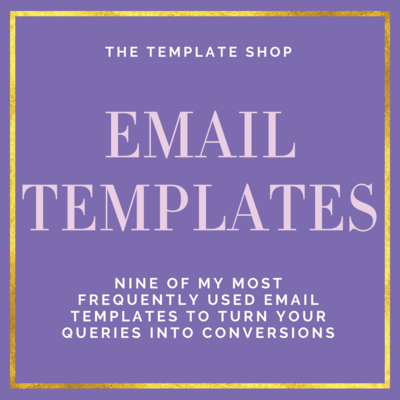 This bundle includes nine of my most commonly used email templates, an invoice template (also great for professional looking price quotes) and a detailed client questionnaire you can use to prepare for your sessions. They can all be easily branded and plugged into any software you already use. Turn queries into conversions! These email templates take all the guesswork out of writing emails to your clients so you can focus more on what you love doing the most: makeup! 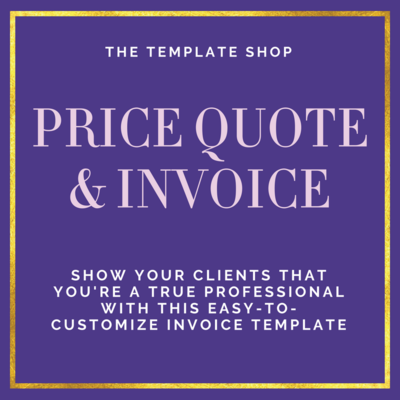 Sending over a professional quality price quote sets the tone for what your clients will expect when they work with you. I used this template for years until I switched over to Honeybook for client management and payments. However, I still use this template for studio work and anything that falls outside the scope of Honeybook. You can easily customize these templates with your branding, logo, and preferred font in a few clicks. Easy-to-follow instructions are included in the digital download and some of my tips and advice from my years of working with clients. 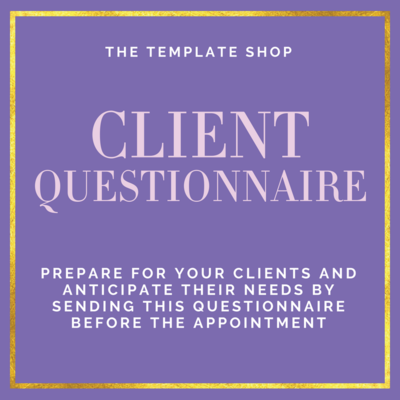 Don’t be unprepared for your clients and their makeup needs! Allergies, preferences, skin type… you need to know these things ahead of time. – Show how professional and prepared you are! I love to do makeup & teach people about makeup! It's that simple. It's my passion, and honestly, I feel like I was born to empower people & makeup is my vessel to reaching that goal. 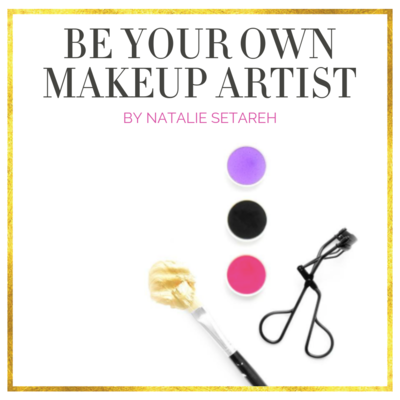 Whether you're interested in mastering your everyday makeup look so you can become your own makeup artist or you want to become a professional makeup artist yourself, I have the perfect services and resources to help you reach your goal. If you'd rather hand over the reigns and have me doll you up for a special event or photoshoot, I can do that, too. We'll chat about makeup, eat some chocolate, and have a great time! No, I'm not sending out free eyeshadow palettes or PR kits, but I *do* give away TONS of free knowledge over on my blog. Ask me questions and I'll respond to them in my "Ask Setareh" blog series. Listen to my latest podcast episodes, and find out which products I recommend... and which ones I don't. Since my posts are not sponsored, you can rest easy knowing there's no tricks up my sleeves. I want my platform to empower you to re-take control of how you shop for, use, and think about makeup! Get on my VIP list, yo! While I do have an email list, I only really have time to send out an email once a month. Maybe a few times more if there's something amazing to announce. I hate spam and promise not to waste your time.